Chai is like getting a big warming hug! Chai calms the mind, improves digestion and provides wonderful health benefits. In the cold winter months, chai is the perfect addition to your diet. It’s bursting with nourishing Ayurvedic spices that help boost your immune system, keeping away those nasty colds. Ayurvedic medicine stems from the ancient root of india and has a holistic approach to health. This wonderful tradition believes herbs and spices are the heart and soul of the kitchen because of the healing powers they can provide. 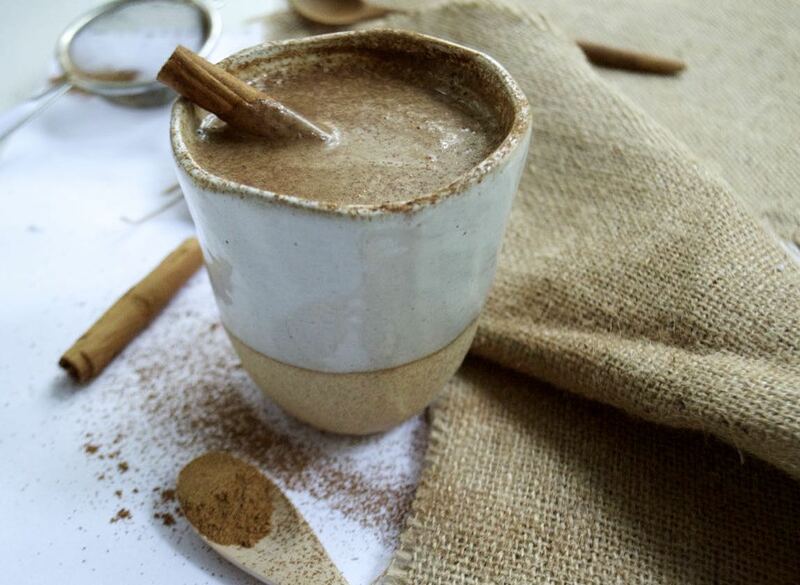 This Chai Spice Latte has the perfect balance of exotic spices and sweetness with the addition of the coconut or almond milk blended with a medjool date and topped with cinnamon… It’s absolutely delicious! I like my chai to be strong, so I added about 2 teaspoons of the mix in mine but you can adjust the flavour to your liking. My tip: try starting off with less and add more if you please. Hope you enjoy!! BLACK TEA// Rich in antioxidants and is anti-inflamatory which can be helpful for digestive disorders. A L L S P I C E// Anti-imflamatory, warming and soothing and aiding in digestion. C L O V E S//Anti-fungal, antibacterial, antiseptic and loaded with antioxidants, essential minerals, fibre and vitamins. N U T M E G// Anti-fungal, anti-depressant, a good source of minerals and rich in vitamin C, folate acid, riboflavin and vitamin A. C A R D A M O N// Helps with bad breath and soothes the stomach making it ideal for digestive issues. G I N G E R// Will assit in eliminating congestion and fight off virius, relieves indigestion and aids in digestion. B L A C K P E P P E R// Has a positive affect on boosting our metabolism, it is an antioxidant and has antibacterial properties. S T A R A N I S E// Has anti-virel, anti-fungal, anti-bacterial and anti-imflammatory properties. The chai spice mix makes about 6 chai lattes. Add all the spices in a small jar (you will need to ground the cloves, star anise and black pepper) and mix well together and leave it to the side. Pour the milk and water into a saucepan, add 2 teaspoons (if you want it a little stronger add ½ teaspoon more or if you want to make this for two, simply add more chai mix and milk) of chai mix and bring to boil. Keep an eye on it and make sure it is stirred regularly. Once it is boiled, add the medjool date and let the chai sit for a few minutes. Pour into a blender and Blend until combined well. Pour into a mug (I poured it through a mesh strainer so there was no chunky bits), top with cinnamon and a cinnamon stick if you like and enjoy! You will still have enough chai spice mix left for a few more chai lattes to enjoy! I just made this delicious and creamy topped tea with the aid of my new ninja bullet processor. Wow, it will be a staple for me in winter. Yum! Thank you. This looks amazing! Can’t wait to try. Also, where is that stellar mug from?